Have you always wanted to rule the oceans? Do you feel drawn to water, inexplicably? Do you dream of a chariot drawn by fish-tailed horses? Do you find yourself acting out myths from ancient times? Do you get giddy whenever you take a bath or even just hang out by the pool? According to our medical checklist, you are not sick...you are Poseidon (or Neptune or Triton or whatever you want to be called)! Congratulations! You are the God of the Sea and as such, you’ll be needing a magical fishing spear. 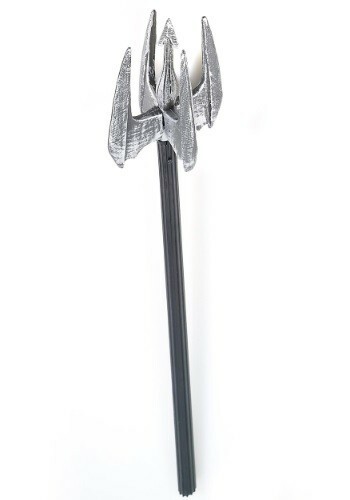 This Trident Accessory may not have been forged by cyclops, but we are pretty certain that it carries with it the power to transform you into a revered and fearsome Greek god. Now that your look has come together, it’s on to the harder part--ruling the seas, controlling the earthquakes, and taming all those wild horses!